“The World's A Headmaster Who Works On Your Faults. I Don't Mean In A Mystical Or Jesus Way. 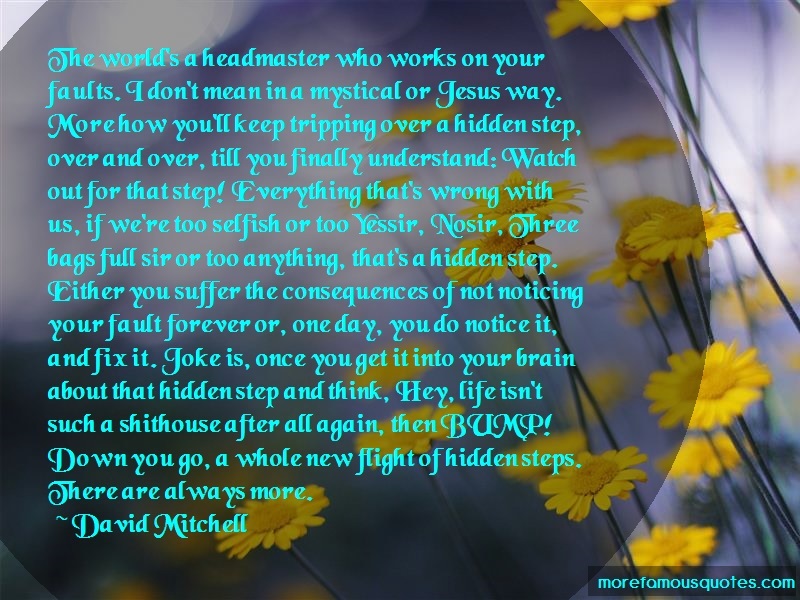 More How You'll Keep Tripping Over A Hidden Step, Over And Over, Till You Finally Understand: Watch Out For That Step! Everything That's Wrong With Us, If We're Too Selfish Or Too Yessir, Nosir, Three Bags Full Sir Or Too Anything, That's A Hidden Step. Either You Suffer The Consequences Of Not Noticing Your Fault Forever Or, One Day, You Do Notice It, And Fix It. Joke Is, Once You Get It Into Your Brain About That Hidden Step And Think, Hey, Life Isn't Such A Shithouse After All Again, Then BUMP! Down You Go, A Whole New Flight Of Hidden Steps.